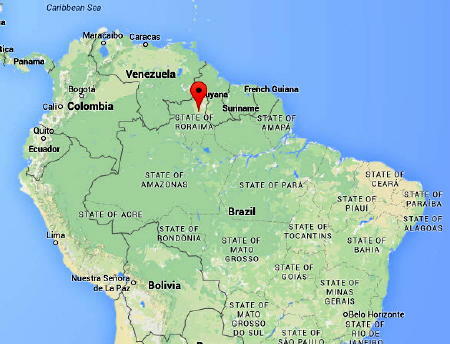 LifeNets partnered with a Good Works/Youth Corps project in Maloca de Moscou, Brazil. in from Dec. 16, 2014 until Dec. 25, 2014. 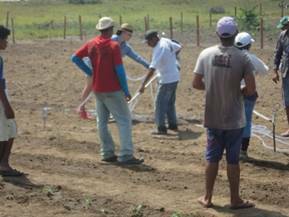 Earlier in 2014 Good Works sent Paul Syltie, a soil expert, to evaluate the farming practices of the local villagers in this remote location. Based on his finding we will be sending volunteers to work directly with villagers to prepare land to be farmed. Conditions will be rustic; the volunteers will be staying in tents and will be helping with food preparation. The team met up in the Miami airport on December 16, 2014 and the projected proceeded from there. 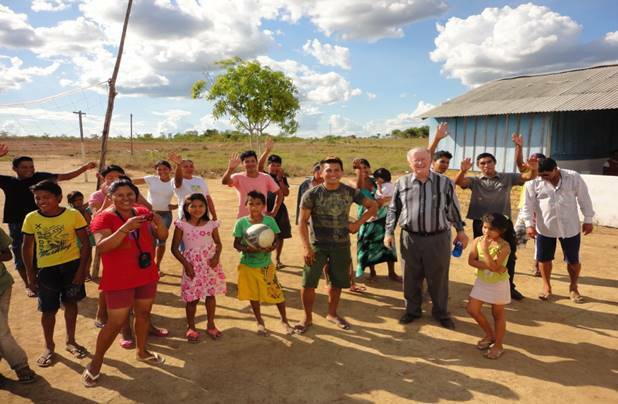 On December 16th, 2014 the combined efforts of Good Works, LifeNets, and the United Youth Core (UYC) sponsored seven individuals and the Senior Pastor of Brazil, Jorge de Campos, to travel to Maloca de Moscou, Brazil, a rural village an hour and a half outside the city of Boa Vista. This tiny village is populated with loving, giving, open-minded, God-fearing people who welcomed us whole-heartedly. Our mission, being led by God, was to incorporate our knowledge of a sustainable growth program with the agricultural knowledge that the people of this village already had. Our presence here also served to provide more of a work force to plant a community garden and orchard. To any man this seems impossible to do in just ten days but with God, anything is possible. Upon arrival, we all still had only a very vague idea of what actually needed to be accomplished or what had already been accomplished. Our first steps into the 1/3rd acre garden plot helped us to realize the amount of pure physical labor that would be necessary to accomplish the task at hand. We also were shown that a pipeline and irrigation system had to be run from the well (which was installed before our arrival) to the garden area. This is where God showed us why He chose who He chose for this project. Each person selected for this project played a very important role. We had an individual who knew about plumping and pipe work, able to spearhead the planning and building of the irrigation system. Also present for the planning and execution of this service project was a man with a doctorate in of soil fertility who knew everything that needed to be done to make this garden function at full capacity. The other members had agricultural backgrounds and knew the plants and the soil very well. The villagers had an amazing work ethic and the effort they put in will be displayed in the future by the fruits that come out of this garden and orchard. Next began the physical work. Our goal on day one was to take a large pile of manure and spread it across the garden area using wheelbarrows, buckets, and burlap bags. Participants would then spread the smaller piles using rakes. We also spread lime over the plot to increase soil fertility, and hired a tractor to till all the material into the ground. This process made for a hospitable environment in which plants will be able to thrive. To complete this particular task required all of our strength plus the assistance of God, but the extremely difficult work was made more enjoyable by many cheerful attitudes. 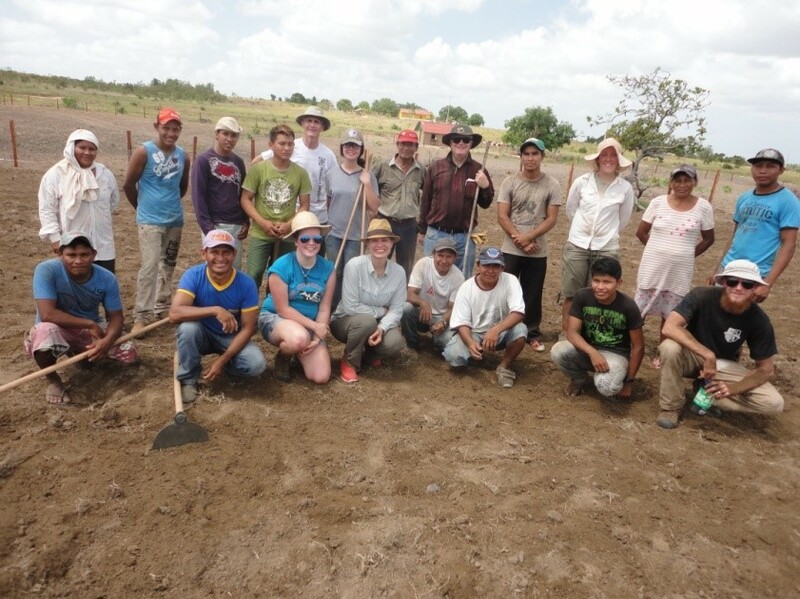 The remainder of this service project was spent implementing a functioning irrigation system, burying pipe line, making garden rows, planting seeds, watering, planting more seeds, and planting trees such as banana, cashew apple, palm, citrus, sugar cane, cassava, and so on. At the same time proper planting techniques and plant care methods were being taught to the local people. This all was communicated through broken English, broken Portuguese, some translation, and a lot of hand signals. This took patience and understanding from everybody involved. Through this process, however, we were able to see how God is able to create unity between people who can barely communicate with one another. The last and most important thing God accomplished during this ten day stretch was expanding a family! We began with a compass check every morning to focus our thoughts and minds on God. We played card games or Scrabble, sang hymns together, strummed guitar, or played volleyball every night. We grew in love for one another every day, and conveyed that feeling through our actions until it felt as though there was no language barrier at all. Our faith in God created a long-lasting unity between the local villagers and us, the members of the UYC. Under the direction of God, this project has been able to bring forth new life, sustainable growth, flowing water, and a united family from two different parts of the world. The glory goes to God!